Barrett's Boston Banter: And a Happy New Year! Well, this week was fabulous! We had so many awesome things going on! Let's start with Monday.. So for P-day, Sister Saito and I decided to take a trip to Boston, since neither of us have really been around Boston much. So we took the "T" and went on our way! It's not too long of a trip! It was so much fun! We went shopping and saw the city a little bit. I forgot what it's like to be in a city...it's kinda scary, but we had such a great time! A familiar store in Boston! On Wednesday we had our Christmas Conference! That was a blast! We started off with various trainings and talks. My favorite part was when President White, the First Counselor on our mission presidency, got up and gave a talk/training on how we can become consecrated missionaries. I've been thinking and praying a lot lately about how I can be a more consecrated missionary and that just answered all my questions and gave me A TON of action items! I LOVE MISSIONS! Me with all of my companions! Well, the ones who are still here! President Miller and our zone at the Christmas Conference! On Christmas Eve we had a district meeting where we all brought some food and did some Zion building activities, and our District leader gave a spiritual thought about Christmas. It was really nice to get together as a district and build Zion together! Then we helped the Digital Sisters, Sister O'Keeffe and Sister Markert, with one of their Skype appointments. It was with a Brazilian guy. We read Alma 34 with him in Portuguese and we all bore our testimonies to him. 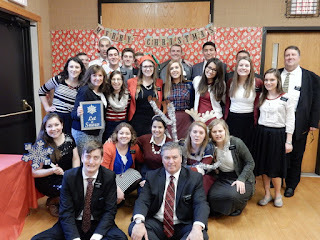 It was really sweet, and it was cool to teach with them :) They're awesome missionaries! Then came the big day! Christmas! It was so great to talk to family and friends! Also, the ward was more than welcoming to us on Christmas day. We had more appointments than we could handle! We had a breakfast appointment, a lunch appointment, a random in-between appointment, and then a dinner appointment with our investigators, Gilka and Tarcio. Gilka made a Brazilian feast! I felt like a beached whale afterwards, but all is well now. It was a really great Christmas and I just loved celebrating the birth of our Savior, Jesus Christ. Then during Sunday school, these 2 Brazilians just came in. They're not members, but a family in the Portuguese group invited them to church. They're a couple, Michelle and Gil (we noticed we're teaching like 5 people named Michelle) and they just moved to the United States 2 weeks ago! They're super solid! They have so many questions! We're so excited to teach them! Also, Sacrament meeting was just beautiful yesterday. The talks were all about how we can be better disciples of Jesus Christ and they were really powerful. Also, in the Marlborough ward we have a musical number every week in Sacrament meeting, which I absolutely LOVE. Like I said before, everyone here is super talented, and it's amazing to see all these people using their talents to bring such a sweet spirit! I love this place so much! I LOVE being a missionary! I love sharing the gospel with everyone! The church is TRUE! I love you all! Have an amazing week and HAPPY NEW YEAR!